I have talked at length about my previous eating disorder and how difficult it was for me to overcome it. One of the hardest parts is learning to trust your hunger signals. Since I had been limiting my food intake for so long, my stomach had shrunk considerably. This made it very hard for me to get in the amount of calories I needed. Often, I would feel really full after a meal, but after a few hours I had a lot of energy and felt good. On the other hand, if I would listen to my body and stop eating when I wanted I would feel pretty crummy a few hours later even though I did not necessarily feel hungry. I later learned this was my body needing energy. I had gotten so used to a lack of energy from low food intake that I did not notice it until I started my recovery process. I know I am not the only one who has a hard time listening to their body’s hunger and fullness signals. In fact, I just finished reading a great book called, “Mindless Eating”, which talks about this exact thing – our inability to modulate how much we eat, largely due to external factors. This book, and the strategies I am going to share below, are more about how to limit food intake versus increase it, as I had to learn to do when gaining back my weight. However, I now realize I used some of these strategies – just in the opposite direction. 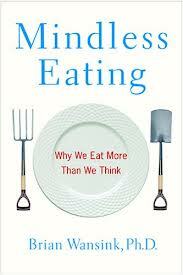 For example, the author of “Mindless Eating” Brian Wansick, PhD. discusses how we will easily overeat if there are more people around, if our plates are larger, if the product says low-fat, etc. So today, I want to go over simple ways you can tweak your environment to control your food intake (if that is your goal). 1. Put 20% less food on your plate. Studies show that you probably won’t even notice it. If you try to eat 30% less you may start to notice. Dr. Wansick writes, “While most Americans stop eating when they’re full, those in leaner cultures stop eating when they’re no longer hungry. There’s a significant gap between the point where an Okinawan says, ‘I’m no longer hungry,’ and where an American says, ‘I’m full'” (p.34). 2. Plate your food before you eat it. Many people snack on foods out of boxes and packages, but a better strategy is to get out how much you think you will eat and put it on a plate (remember, 20% less). If you are still hungry after, then go back for more, but most of the time this will not be necessary. 3. Use smaller, bowls, glasses, and plates. You have probably heard this strategy before. This works because the same serving of a particular food will look much larger on a smaller plate than on a larger plate. 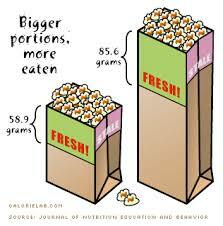 This will trick our brains into thinking we have eaten more than we really have. 4. Try to limit your food variety within a meal. While it is a good idea to eat a variety of foods, if you are trying to eat a little less then it is a good idea to limit the variety of foods within a single meal. It is fine, and probably beneficial, however, to have a variety of foods throughout the day. The author writes that, “The first bite of anything is almost always the best. The second a little less, and the third less again. At some point, we’re tired of the yogurt or cake. But if we add two more types of yogurt, or if we add ice cream to the cake, our taste buds are back to the races. This is why we eat more when there is variety” (p.72). 5. Keep tempting foods out of sight, or preferably out of the house. The more you see these tempting foods, the more they will be on your mind. And, the easier it is for you to obtain these foods the more likely you are to eat them. “…the convenience of a food pretty much determines whether we will eat it or not. If people have to go to a separate lunch line to pay for candy and potato chips, they buy less. If the salad bar is farther away from the table, they will eat less salad” (p. 87). 6. If you eat with a group of people try to pace yourself with the slowest eater. It is great to go out with friends and family for meals, but the problem is that we often overeat in these situations. In fact, the author’s lab has shown that, “On average, if you eat with one other person, you’ll eat about 35 percent more than you otherwise would. If you eat with a group of seven or more, you’ll eat nearly twice as much – 96 percent more… a table for four, you’ll end up right in the middle – you’ll eat about 75 percent more…” (p.97). 7. Be mindful when you are eating. What I mean by this is try to get rid of distractions and enjoy your food. Chew it thoroughly and eat slowly. Take the time to enjoy the flavors. 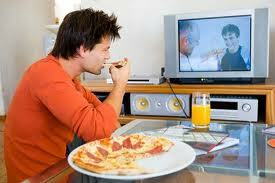 No wonder we have no idea how much food we are consuming – we are always distracted while we are eating. Note: Sometimes it is good to eliminate a food, especially if you have allergies or an intolerance to it. Also, some “diets” that eliminate food groups can be beneficial if they allow you to determine if you feel better without a particular food or food group. For example, I know I feel much better without dairy, but I do not label it as bad for everyone. I just know that I feel better without it. You sometimes have to experiment to find what works for your body. These strategies may seem very basic, but small changes can make a huge difference over the course of the year. “If we make three small, 100-calorie changes, by the end of the year we’ll be as much as 30 pounds lighter than if we didn’t make them. Even if you only succeed in making one or two of them, you are still going to weight 10 to 20 pounds less in a year” (p.214). Now, I do not want you to get hung up on the calorie part of the quote. The idea is that the strategies I have listed above should help you shave off a few hundred calories here and there without even noticing or counting. And these small changes, as you have seen, can make a big difference in your physique a year later. Lastly, I want to make this clear that these tips are only for people that want or need to reduce their food intake. In my opinion, this is not the best strategy for a lot of people. I would rather see people try and increase their energy output through exercise and movement rather than restricting food intake. However, I understand that there may be times when you need to decrease your caloric intake, and I believe these strategies will help make this process less restrictive. If you are unsure as to where you need to start with changing your physique you can look into my online coaching services. I have worked with several people who assumed they needed to decrease their calories to be happy with their bodies, but often I have kept their calories the same or upped them slightly to help fuel more activity and movement. In the end, these people were much happier with their bodies and the amount of food they were eating. Emme’s Training Log: Week of May 6 – New Program!! Thanks Zach! I have a real problem with eating whatever is in front of me. I can control this at home, no problem. But we are going on vacation this weekend and I know I will have to be more mindful. I am going to be active, which should help. Wish me luck that I don’t give up for the week! Emme’s Training Log: Meet Week! Emme’s Training Log: Some Good Lifting and A Family Friendly Hooter’s? 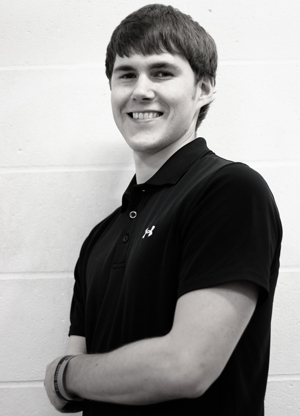 Zach Moore is a full-time strength coach at Indianapolis Fitness and Sports Training (IFAST) – named one of the top 10 gyms in the U.S. by Men’s Health magazine in 2009 and 2010. ...read more."